Throughout the school year, many events punctuate the life of our school. Whether the back to school picnic, Bistro hosted by EFAC parents during Thanksgiving Fest at Lincoln School, or Camp CAFE in May, everything is done to make parents and children feel included in activities within the school. Below, a small panorama of the highlights of the year. It is a tradition at EFAC to organize every year on the first Saturday of the school year, a picnic in Oz Park, which is located close to the school. This is an opportunity for families to gather in a friendly environment, share first impressions and especially to meet and welcome new families. Children who have not seen all summer are usually delighted to meet again to play in the playground while parents and teachers are better acquainted. 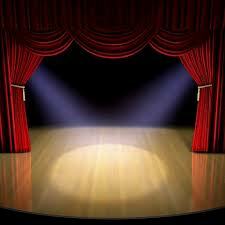 If you are a new family of EFAC, do not miss this moment. After the first opportunity to welcome new families at the back to school picnic, it is tradition to organize a breakfast gathering for new families to continue building new relationships but also share tips of the life of the EFAC parents! From October to April, discover your hidden talents and become narrator while reading our French tales to students of Abraham Lincoln Elementary School. The EFAC participates in extra-curricular activities of Abraham Lincoln Elementary School in hosting a French choir, open to fifteen students from 5th grade to 8th grade. This choir meets on Wednesdays after school. Here is a great way to enhance partnership between both schools. The EFAC participates in the Thanksgiving Fest of Abraham Lincoln School in organizing a stand called “The Bistro”, which sells drinks, pies and cakes, made by parents. All proceeds are donated to Abraham Lincoln Elementary School. 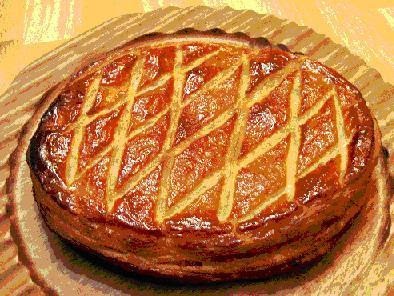 There is not only culinary traditions in France, but we must admit that our reputation is second to none. The months of January and February, the parents of the EFAC are involved in preparing King’s cake and pancakes. Then they animate and distribute their confections in the school for the American and Francophone communities. Children enjoy these moments of collective tasting and sharing culture, which were also very well received and appreciated by the community of Abraham Lincoln and the teachers of FLE (French as a Foreign Language). 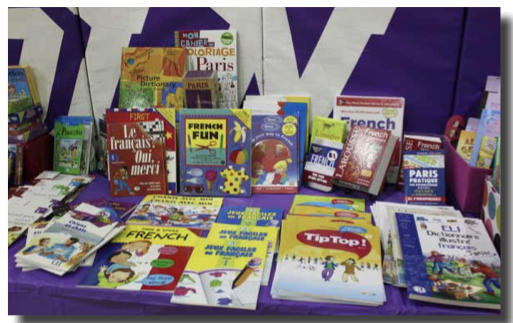 The EFAC participates in the book fair of Abraham Lincoln Elementary School, by taking a stand of French literature, with the help of a downtown European library. Here is another great way to share new French books to all Francophones and Francophiles revolving around the school. To thank the entire faculty of Abraham Lincoln Elementary School, the parents of the EFAC organize a French breakfast. The expertise and the flavors of our French cuisine is always a big hit with all the teachers. 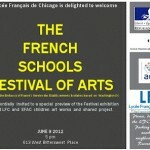 The EFAC is associated with the French Lycée of Chicago to organize a festival of Art. Implemented with the support of AEFE, this artistic project is aimed at all levels of the school and allows our young students to express their talents in a cultural perspective. represents an average of a hundred children. The camp cannot take place without the parents who volunteer with the EFAC teachers and those of Lincoln. Monday morning to Thursday evening, the French teachers of EFAC and Lincoln as well as parents francophones (twenty) come to mentor teams, French lessons and activities, bowling, cooking, sports, art, mime… The last night of the camp is concluded by an amazing spectacle is organized in color and songs … French of course! The Ciné-Club offers a free monthly screening of French films (with English subtitles). The event is open to students of EFAC and Lincoln grades 5-8. A session also takes place on the campus of LPHS for students. 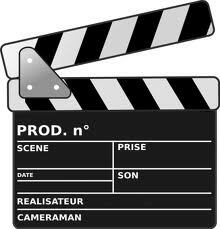 Parent volunteers to ensure the smooth running of the sessions both on visual supervision of students during the movie and until they leave. La Kermesse for the grand finale! the assembly: emotion at the graduation for 12th graders but also for the students that follow the next chapter of their scholarship in other institutions; proud parents watching their young seeds of artists; but also joy and smile watching and listening to the performances; friendships and shared delicacies around the buffet after the show. And now let’s leave room for the artists!